I’ve been nominated for a Reader Appreciation Award by the lovely Melissa Mostyn-Thomas, who blogs at themostynthomasjournal.com. A deaf mum and journalist, her blog gives her perspective on being a Mum to a disabled child; daughter Isobel, who has Cerebral Palsy. Baby Ben is the newest member of the Mostyn-Thomas family and also features; it’s a good, honest blog about the ups and downs of their unique family. Thanks for the nomination! I started blogging a while ago but only started updating more regularly last year, as more and more I found it a useful and sometimes therapeutic outlet for the things that piss me off or that I find just plain silly, or in some cases, both (Ofsted, I’m looking at you). The last few months have been great in terms of the blog, and I hope I can keep it up! Thanks to everyone out there who visits my blog, I’m really glad you like it and thanks for the comments and encouragement! 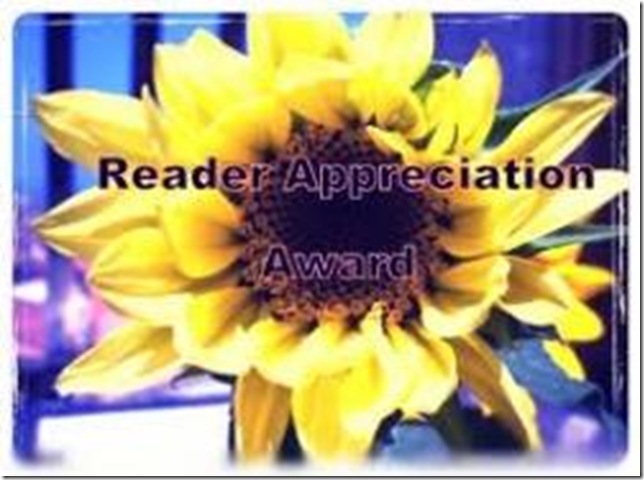 When you nominate a blog for The Reader Appreciation Award, you are stating you admire the person’s blog and recommend people check it out. Once you receive a nomination you must follow these rules. 2. Answer 10 questions (detailed below) about yourself, if you want to. 3. Nominate 10-12 blogs that you love. Or you pick the number. 4. Contact the nominated bloggers to let them know. 5. Thank the blogger(s) who nominated you with a link in your blog. 1) Favourite colour? – Blue. But not any kind of blue, it’s a sort of bright, azure blue that makes me think of beach skies and beautiful water. If you meet me, ask to see my watch. It’s that colour. 2) Favourite animal? – This is my favourite animal. 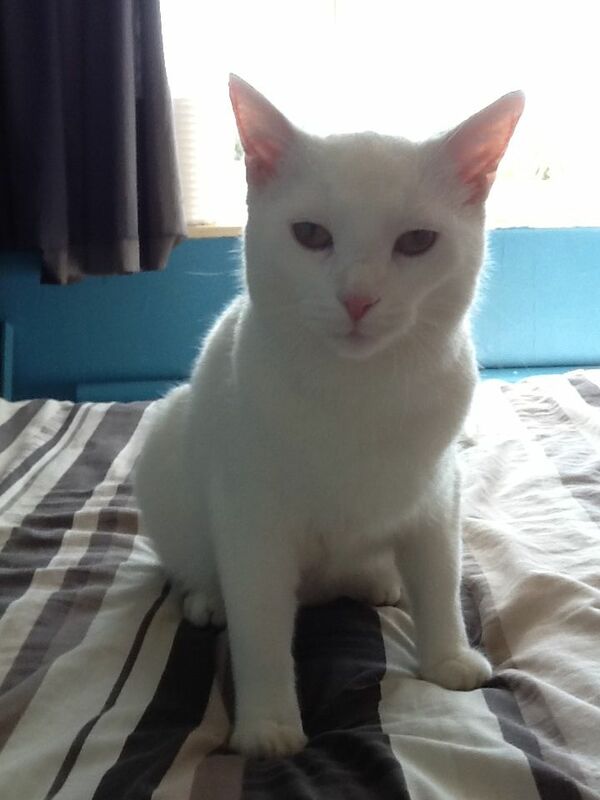 His name is Yuki, he’s one year old and he’s very deaf. I love him dearly. 5) Favourite pattern? – Hmm. I have a couple of cushions decorated with stars and moon shapes. I guess that’s my favourite pattern. I’m not really into patterns. 6) Do you prefer giving or getting presents? – Ooh. I like the challenge of getting or making just the right present for the right person, and really happy when I get it right as it’s great to see the reaction, but at the same time I like getting presents – who doesn’t? Call it a 50-50 draw. 7) Favourite number? – Thirteen. I know it’s considered an unlucky number, but it’s also my birthday, and I get presents on my birthday, so it’s always been a lucky number for me 🙂 And no, I was not born on a Friday. 8) Favourite day of the week? – Any day when I feel like I’ve managed to make some headway into my to-do list. 9) Favourite flower? – I don’t really do flowers. That said, the flowers on my courgette plants are a very pretty yellow, and what’s more, they’re edible. 10) What is your passion? – Only one? I have many… science fiction, which if well-written can be thought-provoking as well as fun, books, poetry, disability and deaf rights, ethics, especially ethics of genetic manipulation and other medical issues, from a deaf / disabled, i.e. my perspective, as I feel we need more people who are directly affected by the issues in this arena. As it says on Gregor Wolbring’s site – “nothing about us without us.” And cats. I really love cats. Anonymous Interpreter – This is a blog run by a Sign Language Interpreter, it gives SLIs the opportunity to air their views on various issues with some anonymity, and it has also discussed issues linked to the Ministry of Justice interpreting contract. Informative and thought-provoking. Diary of a Benefit Scrounger – I came across this blog last year, while ranting against the Welfare Reform Bill. This lady is no scrounger, and spends more time ill than anything else, but campaigns unflaggingly against the cuts to welfare services and discrimination against disability in government policies. Our Statures Touch the Skies – I’ll be honest, I only found this blog yesterday through themostynthomasjournal, but already I love it. Short biographies of famous and not-so-famous disabled people, and a good reminder that disabled people have been doing it for themselves for a very long time! Stage and Sign – Written by Sami Thorpe, a hearing BSL-using theatre lover who discusses and advocates access and inclusivity in theatre, we need more like her! The Limping Chicken – A blog born out of a fleeting but memorable news story, now a deaf news and features site with a memorable name. I read this most days, whether it’s a deaf-related news story or a Secret Deafie. What Sorts of People – This blog is a place for researchers, disabled community members and individuals working in different disciplines to connect and discuss various issues linked to the ‘What Sorts of People Should There Be?’ project. Very informative, thought-provoking, and occasionally depressing. This entry was posted in Uncategorized on June 20, 2012 by DeafFirefly. Congratulations! Love this blog – always an interesting read. Many congratulations! My favourite blog? DeafFirefly of course!